The Ballarat Reform League Inc launched a major project in 2003 to place monuments on sites across the Victorian goldfields where there were significant actions that culminated in the formation of the Ballaarat Reform League in November 1854 and in the battle at the stockade on the Eureka lead, Ballarat, on 3rd December 1854. The former Star Hotel, Main Road, Ballarat, the meeting place of the Ballarat Reform League in 1854. Hiscock Gully Road Buninyong where gold was officially first discovered in August 1851 in Victoria and where the first protest meeting was held when the government announced it would charge an onerous licence fee. Chewton (Forest Creek) where the first Monster Meeting was held on 15 December 1851 objecting to the government’s unjust and exorbitant tax on gold diggers and its plans to increase that tax. Beechworth at Madman’s Gully, near 124 Stanley Road. It was here that the first demand for political representation in the Victorian Legislative Council was made on 2 April 1853. Bendigo A Monster Meeting was held on Camp Hill on 28 August 1853 to protest against the licence fee and the way it was policed. Known as The Red Ribbon Agitation it resulted in suspension of the licence for September 1853, a victory for compromise and commonsense. Creswick A plaque was placed at the entrance to Calambeen Park to mark the angry protest of diggers in October 1854 against the oppressive licence system. On 29 November many Creswick diggers set out for Ballarat to support the Ballarat Reform League’s protest. Bakery Hill, Ballarat First plaque. It was here on 11 November 1854 at a Monster Meeting that the Ballarat Reform League Charter was unanimously adopted calling for manhood suffrage and full and fair representation. 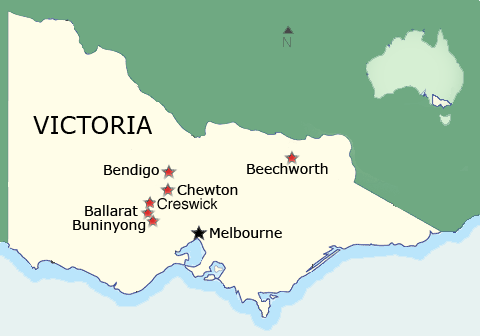 The Ballarat Reform League was officially formed. Bakery Hill, Ballarat Second plaque. It was at Bakery Hill that on 29 November 1854 at a Monster Meeting, held around the new flag, the Southern Cross, the diggers learnt of the failure of talks with Governor Hotham and the Ballarat Reform League representatives. In anger the diggers voted to burn their licences. The Eureka Stockade, Eureka Street, Ballarat. Protest had turned to resistance, which the authorities interpreted as insurrection. On 3 December 1854 a superior government force attacked a makeshift stockade. Many lives were lost in an unnecessary battle and the government was condemned. Finding a boulder for the Eureka Stockade monument. 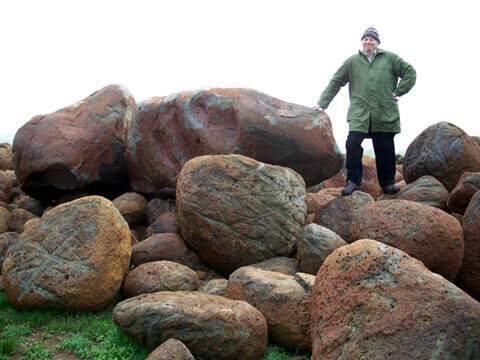 John Williams stands by the chosen rock at Learmonth. The installation of monuments to commemorate the activity at each of these sites has been documented and supported by informative Essays written by eminent historians. This project has been generously supported by The Vera Moore Foundation.